You just got a fully loaded jeep with lots of cool features. You’re excited to get it out on the Spillway and test them all out. But, you want more….you demand a lot from your vehicle. Whether your Jeep needs power or more flexibility to really fly through the mud off-roading, there are some great options available with a Bully Dog tuner. There are a lot of great features you can get from a Bully Dog GT to bring your Jeep to the next level to get that more you demand. Below are 5 great features that you can obtain from a customized Bully Dog Jeep. 1. Reach deep for more horsepower and torque. 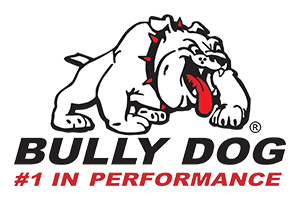 Bully Dog tuners allow you to adjust key parameters like transmission shift points and throttle response to inspire peak performance tailored for the way you drive. The GT helps you get the most from your powertrain no matter what the conditions. 2. Make sure your gauges read right. Changes to gear ratio and tire size affect speedometer, tachometer and odometer accuracy. Your tuner provides gauge readings that are adjusted for modifications you’ve made to your Jeep, so you won’t ever have to second-guess your gauges again. 3. Put an end to constant dash alerts and chiming. Sometimes the demands of the trail mean you need to air down your tires to get proper traction on uneven terrain. But your Tire Pressure Monitoring System (TPMS) loses its mind, annoying you with dash alerts and chiming. The Bully Dog GT lets you deactivate the TPMS when you’re aired down, and reactivate it when it’s needed, in more normal driving conditions. 4. Get more power in idle. Jeep sets your idle RPM at a level that combines battery charging power with fuel efficiency. But what about those times out on the trail when you’re in a jam and need more power to run your winch? Bully Dog tuners allow you to increase idle RPM to provide power for your winch when it’s needed, so you can tackle difficult terrain without fear, and still keep fuel costs in check. 5. Adjust to difficult trail conditions on the fly. In addition to the power boost that you get from engine tuning, Bully Dog GT offer special features that allow Jeep owners to make changes on the fly to adjust to trail conditions. For instance, turn off your engine fan when fording a river, disconnect sway bars or lock axles for safety, traction and stability on uneven terrain. The tuner also offers a simple way to completely disable traction control in snowy, icy, sandy or muddy conditions.